The nursing care plan focuses on actions which are designed to solve or minimize existing problem. The plan is a blueprint for action. The cores of the plan are the approaches, strategies, activities, methods and materials which the nurse hopes will improve the problem situation. The nursing care plan is a product of a deliberate systematic process. The planning process is characterized by logical analyses of data that are put together to arrive at rational decisions. The interventions the nurse decides to implement are chosen from among alternatives after careful analysis and weighing of available options. The nursing care plan, as with all plans, relates to the future. It utilizes events in the past and what is happening in the present to determine patterns. It also projects the future scenario if the current situation is not corrected. The nursing care plan is based upon identified health and nursing problems. The problems are the starting points for the plan, and the foci of the objectives of care and intervention measures. The nursing care plan is a means to an end, not an end in itself. The goal in planning is to deliver the most appropriate care to the client by eliminating barriers to family health development. Nursing care planning is a continuous process, not a one-shot-deal. 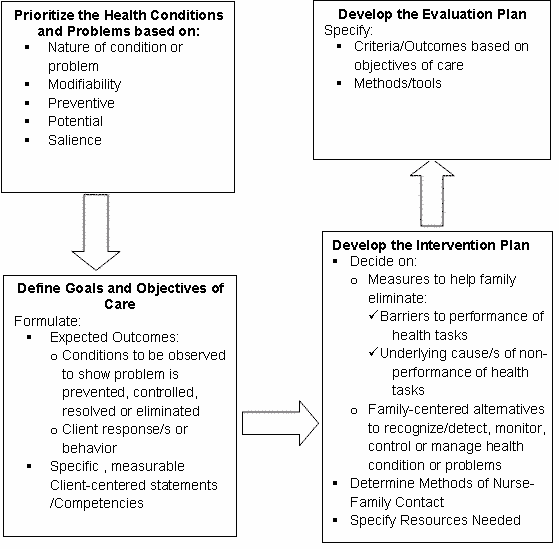 The results of the evaluation of the plan’s effectiveness trigger another cycle of the planning process until the health and nursing problems are eliminated. The assessment phase of the nursing process generates the health and nursing problems which become the bases for the development of nursing care plan. The planning phase takes off from there. This is a schematic presentation of the nursing care plan process. It starts with a list of health condition or problems prioritized according to the nature, modifiability, preventive potential and salience. The prioritized health condition or problems and their corresponding nursing problems become the basis for the next step which is the formulation of goals and objectives of nursing care. The goals and objectives specify the expected health/clinical outcomes, family response/s, behavior of competency outcomes. Nursing Practice in the Community – Maglaya 4th Ed. By perawatunklab in Community Nursing, Family Nursing, Nursing-Advanced Sub on November 6, 2012 .